This seminar offers a diagnosis of the current European debt crisis that traces its origins to inherent flaws in the legal and institutional design of the Eurozone. Questions to be addressed include:– Is the European Monetary Union responsible for the current Eurozone crisis?– What role have core nations such as Germany and France played in the crisis, compared to peripheral nations such as Spain and Greece?– What are the political and economic implications of austerity?– What policies should Europe adopt to resolve this crisis? Marshall Auerback has 30 years’ experience in the investment management business, serving as a global portfolio strategist for Pinetree Capital, a Canadian-based fund management group. He also serves as an economic consultant to PIMCO, the world’s largest bond fund management group, a Research Associate for the Levy Institute at Bard College, and a Research Fellow for the Economists for Peace and Security. Yanis Varoufakis is Professor of Economic Theory at the University of Athens and Visiting Professor at the Lyndon B. Johnson Graduate School of Public Affairs at the University of Texas at Austin. He is also an In-House Economist with Valve Software. From 2004-2007, he was an economic advisor to George Papandreo. Dr. Varoufakis runs a blog at Valve, as well as his personal blog, Yanis Varoufakis: Thoughts for a Post-2008 World. His most recent book is The Global Minotaur: America, The True Origins of the Financial Crisis and the Future of the World Economy, London and New York: Zed Books, 2011. Georges Ugeux is Lecturer-in-Law at Columbia Law School, where he teaches a course on European Banking and Finance. He has lectured at the Catholic University of Louvain, the College of Europe in Bruges, and has advised the International Financial Systems Program at Harvard Law School. Dr. Ugeux is the founder of Galileo Global Advisors, LLC, which specializes in cross borer transactions to and from emerging markets. He has previously served as the Group Executive Vice President, International & Research at the New York Stock Exchange, the General Manager of the investment banking and trust division of Société Générale de Banque (now BNP Paribas Fortis), the Managing Director of Morgan Stanley’s Mergers and Acquisitions department in London, the Group Finance Director at Société Générale de Belgique, and the Managing Director of Kidder, Peabody, Inc. He is a director of Amoeba Capital, British American Business, Inc., and the French-American Chamber of Commerce, and is Honorary Chairman of the Belgian American Chamber of Commerce and of the Catholic University of Louvain Foundation. He recently published a book called “The Betrayal of Finance: Twelve Reforms to Restore Confidence” that was originally published by Odile Jacob in Paris. Or 2:15am ? I dont know the timezone.Please let me know. Thanks. The real problem is the UK post Big Bang of 1986. It has a very dramatic current account defecit. •The United Kingdom’s (UK) current account deficit was £20.8 billion in the second quarter of 2012, up from a revised deficit of £15.4 billion in the previous quarter. •The trade deficit widened to £10.1 billion in the second quarter of 2012, up from £8.1 billion in the previous quarter. •The income deficit widened to £5.2 billion, up from £1.9 billion in the first quarter of 2012. •The financial account recorded net inward investment of £11.1 billion during the second quarter of 2012. Now that the city cannot run oil through the PIigs and get a yield off the waste production it must try to push these sad little countries into current account surplus. Ireland has posted its biggest current account surplus ever and even Greece acheived a current surplus in July. I am all in favour of Fiat currencies withen the confines of defined political borders but its the banks which provide the mechanism of final settlement….they have engineered a system where there cannot be final settlement. All Countries must always be a state of permanent Bankruptcy so that the city can live the life it has grown accustomed to. Now all cities must always be in trade defecit to their hinterland but if they cannot come up with any worthwhile ideas there is no need for cities. I imagine This was the reason for the Breakdown of Roman Rule. Eventually People embraced the Dark ages as at least they could get on with their short brutish lives. Thinking of investing in a Iron Age hill fort…….despite the destruction of the landscape many remain in Ireland. “It has a very dramatic current account defecit. the ca deficit of UK for 2012 is 1.9% of gdp, up from 3.3% in 2011.Thats far from dramatic.Such deficits are sustainable in the very long term. 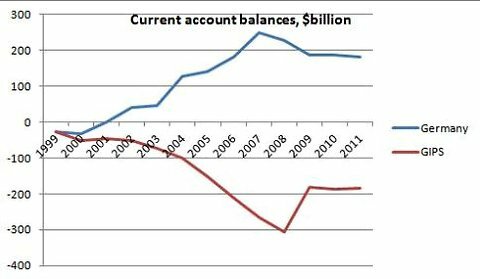 Can Ireland have its record Q2 3.235 Billion current account surplus back again ? We could use it for the domestic demand thingy. Believe me these are big numbers…..its the difference between postive growth and negative growth. You don’t compare those numbers against the entire economic capacity of nations or former nations. “You don’t compare those numbers against the entire economic capacity of nations or former nations..”Yes you do.Unless you believe that a 20bil current account deficit would have the same impact for say Cyprus. Forgive me but I had just the misfortune to listen to Steve Forbes and his strange free market Ideas on irish State radio. He actually stated the free market is best for the energy sector…….. The interviewer never even mentioned the UKs infamous 1990 “Dash for Gas” con job…..
That Gas is gone for good. They have just 1 single state financed PWR to show for this depletion economics. Its a truely strange world when you can have no final settlement . Any old economic theory can work until the externalties manifest themselves….and then its oppps , sorry about that chaps. The real goods trade deficit (inc oil) of the UK was a record £100 billion in 2011. Is Europe a victim of unsustainable international trade /energy connections which reduces rational internal / national demand and rational investment ? Do the IMF only pick Austistic economists with no understanding for political or physical geography. I mean the last time I checked the UK was part of Europe and stuff. Great article: Why Germany is going to leave the EuroZone! What does Germany get out of the euro? Not as much as you would think. It is a common fallacy that Germany has benefited by anchoring its terms of trade with its neighbours through a common currency; this is an error born from neoclassical economic suppositions. Germany’s original supporters of Eurozone membership were its large industrial companies, which were looking forward to a trading environment made easier by a weaker currency. However, it was not long before these benefits were lost, because companies naturally felt less pressure to control their costs. The result is that German companies have (if anything) lost their competitive edge as a result of the single currency, and gains in productivity have been disappointing as a result. The biggest losers have been the ordinary workers, whose wages continued to rise at a very pedestrian pace, if at all. Whereas in the past, a wage-packet bought more as the Deutsche mark rose in value against other paper currencies, that is no longer true. Instead, static wages have lost purchasing power over time, and the result is that growth in real disposable income per capita is virtually non-existent. Workers have been squeezed between a legacy of past wage-bargaining assumptions and a change from a strong to a weaker currency. I believe such discussion could be taken much more seriously if there’d be a more balanced panel. Invite Prof. Sinn, for instance. Would love to debate Professor Sinn. Especially if he came clean and argued openly about the reconstitution of the DM (rather than hide behind the constant recapitulation of the defunct mantra about discipline). Good point! As for balanced – which of your own defunct mantras (be real: there are some, mostly w.r.t your assumptions about the Gerrman role in causes and possible solutions of the desaster) you would throw away then, instead of hiding behind them? The one on which I used to base my conviction that Germany would, in the end, do what it takes to save the Eurozone. Haha, exactly. Germany will throw its citizens into poverty to save something that cannot be saved and risk a second Hitler. I do not think so! I’ve a suggestion. Discuss with Auerback the merits of the plan of the Greek government to build a Formula 1 racetrack in the middle of nowhere, close to Chalandritsa. Of course the government plans this w/o having the money and in the knowledge that F1 is w/o exception for each and every locateion where it happens a huge loss generator. Pls. don’t forget to find a spin to blame this plan on the Germans. We will..once we hear that a German company will be contracted to do the job. Yanis – will there be a recorded podcast after the live stream? Yes and I shall be posting it. You must look on the UK as both a sov country in the middle of a collection of Euro Vassal states and also with a major fin centre (the city) playing chess on this Euro board. In terms of real goods (not services such as Banking) the UKs physical impact on the Euro packs real trade balance is huge – distorting rational trade patterns on a massive scale. Im really sorry but im not sure i can follow what you are trying to tell.I would be glad if you explained further. I dont understand whats your take on UKs role in this. PS . much of the UK “services” in banking is used to manage these absurd trade flows…..these services add to their current account. If Euro states become national economies again with rational internal domestic demand & investment what happens to the UK ? The alien Irish CB has called for more wage cuts to increase our current account surplus …..for every surplus there is a deficit. That was a great talk professor.Totally enjoyed it. Very good seminar! Both you and Marshall were effective in presenting the facts and your solutions. I appreciated the historical prospective of why the different nations, now part of the Eurozone, decided to join in the first place. But at quite price for the periphery. Very good questions from the audience. The rise of Golden Dawn in Greece is a very frightening prospect.